There is 2-way traffic, and a few blind corners on the bench section. The bench is narrow, so check your speed, and keep your eyes open. Dead Ringer is a new trail in the Hurricane Cliffs Trail network completed in 2015. It was built with a partnership between the Dixie Mountain Bike Trails Association and the BLM. The trail was named for the remains of a long passed cow that was found while scouting this trail. She was pretty much just bones, but still had the cowbell around her neck. Dead Ringer provides an easy climb up to the JEM parking lot. The climb is possible due to a very long bench trail built at 6% grade. It's a great climb, but also a fun descent. 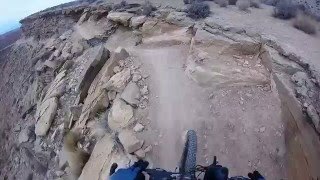 The long bench cut into the steep mesa is an epic section and a "must do". There are two trail splits that offer hard or easy descents. If you like two-foot kickers, follow the "More Difficult" signs. Dead Ringer has it all; great views, easy climbing, and a fast flowy downhill. By itself, it's an out-and back trail, but can be combined with JEM Trail or Goulds Rim trail to make loops over 20 miles. There is 2-way traffic, and a few blind corners on the bench section. The bench is narrow with limited space to pass, so check your speed, and keep your eyes open. 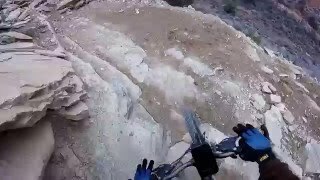 flowy, non-intense climb! nice final day ride! The steady but enjoyable climb up Dead Ringer. The descent of Dead Ringer. A trio of riders make their way along Dead Ringer. Trailside hazard on the Dead Ringer.